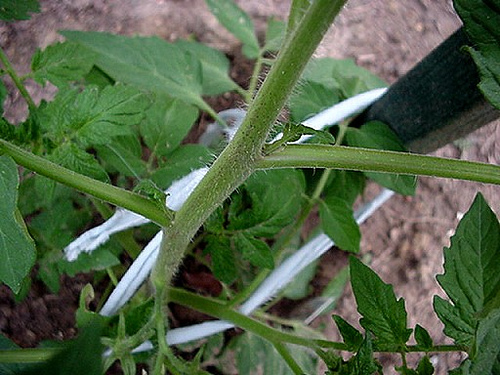 Pruning a tomato plant is one of the most important decisions you need to make if you want to grow tomatoes. And in this article, we will discuss How to prune tomato plants. 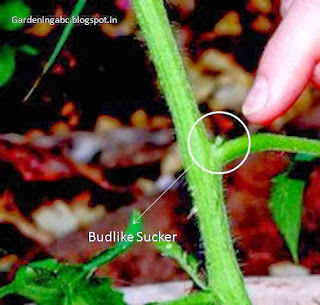 So if you are intersted in know about pruning tomato plants please read on. If you are new to tomato gardening I suggest you read our earlier articles on tomato growing before reading further. Now, let’s start with the basics. Pruning tomatoes can be a very simple process. Sometimes the process is also called “trimming tomato plants”. You just need to find the suckers and snap them off with your two fingers (thumb and index finger). Tomato suckers are easy to find. They grow in between the main stem and the branches. Though we call these “SUCKERS”, these are actually the branches of the plant, that is in a very initial stage. If you leave them to grow, they will soon become fully grown branches and grow fruits on them. So you might be thinking if those are the branches and also give fruit why are we talking about removing them? The fact is the branches of the plant though will grow fruits; the number is far less compared to the main stem and main branches. Most of the energy which the suckers or these branches receive will go into making foliage and more branches. It will ultimately make the plant outgrow its space in the garden. The pruning is done so that the plant directs its energy towards producing larger fruit than to develop foliage. Though the foliage will also develop fruit also, the overall size of the fruit throughout the plant will be much smaller. Lesser foliage also reduces the pest problem and is easier to take care. Pruning also helps the plant in receiving much more sunlight and better air circulation throughout their body. Better sunlight and airflow also means more energy and lesser diseases for the plant. The first type will grow to a certain height and produce fruit at one go. So in that case, if you remove the suckers, the fruit bearing capacity of the plant is greatly reduced. As it will not grow vertically the total fruit yield will be pretty low. In case your plant is of indeterminate type, pruning would actually help to increase the fruit quality. It will also help the plant not to get out of control and the supporting nets will be able to hold the plant. It is best to pluck the suckers when they are very young. The younger they are, the easier it is to prune. In case they got a little thicker and it becomes harder to prune with the fingers, you can use a sharp knife to cut them off. Sometimes the suckers grow so thick that it can be detrimental for the plant to remove those; in this condition, it is wise to leave them as it is. Please bear in mind that pruning a tomato plant is NOT absolutely necessary. You can definitely choose not to prune and still enjoy an acceptable amount of yield. Pruning is a method of enhancing the production, resulting in bigger and tastier tomatoes. It also increases the number of fruits.